Imagine fresh herbs and vegetables grown in your home, year-round. 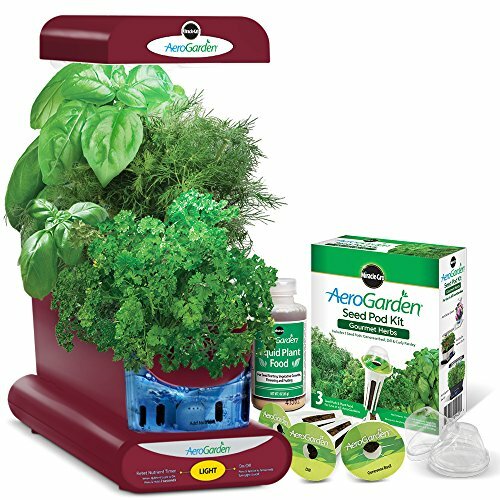 With the Miracle-Gro AeroGarden Sprout you can grow fresh herbs, vegetables, salad greens, flowers and more! This smart countertop garden uses water and patented nutrients to naturally grow plants… no herbicides, no pesticides, non-GMO. It’s natural goodness right at your fingertips. AeroGardens are the world’s leading indoor gardening systems. You can grow up to 3 plants in this garden and they’ll love the energy efficient, high performance, full spectrum CFL (Compact Fluorescent Light) Grow Light. The light is tuned to the specific spectrum that allows plants to maximize photosynthesis, resulting in rapid, natural growth and abundant harvests. With ideal lighting and optimally balanced levels of water and nutrients, plants grow up to 5 times faster than when grown in soil. The Sprout’s easy-to-use control panel creates optimal conditions for your plants by automatically turning the lights on and off and reminding you when to add nutrients. A view window lets you easily see when to add water. The AeroGarden Sprout sets up in minutes without tools. Just insert the Seed Pods in your garden, add water and nutrients, and then watch it grow! Everything you need to start growing is included. Up to 3 plants can be grown at a time. Plants grow in water...not soil. Advanced hydroponics made simple. High-performance, full spectrum grow light is tuned to the specific spectrum that allows plants to maximize photosynthesis, resulting in rapid, natural growth and abundant harvests. If you have any questions about this product by AeroGrow, contact us by completing and submitting the form below. If you are looking for a specif part number, please include it with your message.